I had a request this week to provide some support for teachers who were asked to lead their high school colleagues working in curriculum and small learning community PLCs. I only had an hour during planning periods to provide something I hoped would be helpful. My thinking is that conversation among teachers is critical to change occurring. Therefore the leader’s role is to spark conversation that leads to action. Margaret Wheatley’s writing in A Simpler Way and Turning to One Another points to the importance of conversation. Here are some of her comments from her website. “One of the things we need to learn is that very great change starts from very small conversations, held among people who care. But talking about what really matters – the issues that really concern you – requires courage. Forget about the politics or the staff person who is driving you crazy. What are the things you really have deep, abiding concern for? What is it you really have some passion for? If you go into that question for yourself, you will find the energy to go forward. The conversation should not be based on complaint, but should be based on both passion and a sense of hope. 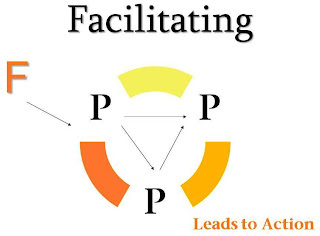 I describe that the facilitator (F) sparks the conversation that then engages the participants (P). The facilitator then encourages the participants to move the conversation into decisions that lead to action. Action is the payoff to teachers for the time and effort that they put into the PLC process. Very often the spark is initiated by questions provided by the facilitator. I recommend using the Questions for Life process to plan initial questions for sparking a PLC and moving to action. • Working with a partner, develop ideas for increased differentiation in the next assignment? (ideas) Ideas are then shared with the PLC. Here is a second model: Teachers are asked to bring the last three days of instructional plans to the PLC session. • Working with a partner, identify an idea for increasing engagement in an upcoming lesson. (idea) Ideas are shared with the PLC. I will be working with a PLC team tomorrow. We will begin the day by observing 4 different classrooms looking for examples of student engagement (specifically looking at LEP and special education students). In the afternoon we will debrief the evidence that was observed and begin work on lesson design incorporating what was learned in the morning. Your questions are right on target and I look forward to using them tomorrow.